I'm an Advanced Bowen Therapist. My training was with Albert LaShell in 2006. I studied massage at Fair Oaks Massage Institute in 2006. I prefer Bowen as it keeps working after your treatment ends, but enjoy giving Reiki. I am Reiki Master Teacher, providing Reiki Circles on Sunday afternoons with Meetup - Reiki Healing Light. I will also be teaching Reiki classes, see the Calendar for dates. 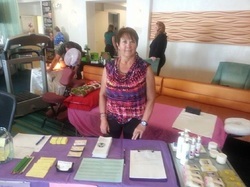 Other treatments include Massage, Reiki Drumming, and Essential Oils - Raindrop Therapy. I am also a Rock Medicine consultant to assist your healing using rocks, minerals and crystals, call or email for a consultation. CAMTC #36958. Bowen & Reiki By Kiki. Please enter your info and I'll get back to you as soon as I can. Ask about currently monthly special!